Ok, ok, ok. Dickens is.....ok. Funny even. Tongue in cheek at times. . .
. . . absolutely delightful? 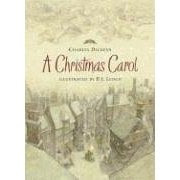 I thoroughly enjoyed reading Dicken's A Christmas Carol this past week. In fact, I enjoyed it so much that I decided to pick A Tale of Two Cities back up and give it another try! Will wonders never cease? My only exposure to this story to date was the Disney version starring Mickey Mouse (which is also delightfully enjoyable). I found that the cartoon followed the story line VERY well. (Of course, that could have something to do with the fact that the story is so short that you really would have no excuse not to follow the storyline!) My favorite character of this story was Scrooge. I thought Dickens did a great job setting up his character and contrasting his old mannerisms and behaviors with his new outlook on life. The more minor characters added stregnth to Scrooge and gave us an even better picture of who he was by the way he interacted with them. The one thing I was surprised about was how little a role Tiny Tim really seems to play in the story. Sure, he gets the punch line ("God bless us, everyone!") but the world does not really revolve around him. I guess everything I've seen that relates to this story kinda points me to the picture of the little cripple boy and I assumed he had more of a part to play. At any rate, Mrs. Rachel Lynde's statement still holds true. You never are safe from surprises until you are dead. I never in my wildest dreams expected to find anything of Dickens that would tempt me to read more of him. Enter: A Christmas Carol. I am stregnthened for the journey! I'm trying to remember whether I have ever actually read this. I think I must have years ago. You're tempting me to pick it up again. :-) Dickens is a favorite of mine but I haven't read him in a while. I love, love, love A Christmas Carol, but despite my best efforts have still been unable to really appreciate the rest of Dickens' work. I struggled (but did make it through) Great Expectations and struggled through about half of A Tale of Two Cities before giving up. As far as I can tell, Dickens has books with great beginnings and great ends, but the middle always kills me! Guess A Christmas Carol was too short to have a big boggy middle part for me to sink into (never to escape to finish the rest of the book) which is why I like it and not the others! I read this to the kiddos about 5 years ago but was considering reading it again this year. 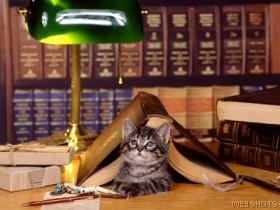 I am a Dickens fan. I even named my cat for him. =) Happy Holidays! Ah, hope springs eternal! Carrie reading Dickens. Yeah! Each year I taught (Christian School) we would read one stave a day and then, when we were through with the book, we'd watch the movie version where Patrick Stewart plays Scrooge...very close to the text. What makes the read even more fun is to alternate candy canes and hot chocolate as you read through each stave [stave means "chorus"...to match with "carol"].